Yes, off on 22nd Oct to Mojacar in Spain. A Warm Weekend in October? Who’d of thought it? Basking in 21 degree weather in mid-October? Time for an end of season BBQ. Thanks to Simon, Linda, Nick & Margaret for organising a “B pontoon” and friends BBQ. We sat in the open marquee – for that’s where all the benches were hiding but the “boys” did the cooking outside. There was burgers, sausages, chicken, jacket spuds, spud salad, ensalada, trifle & pavlova! Plenty of “beverages – various” to wash it all down and with 11 of us (sometime 13 as Bob & Jenny passed thru . . on their way to France! ), a good time was had by all. Just because we’re Not Going Out anymore doesn’t mean that the “fun” of boating stops, oh no. With a night of very heavy rain we discovered two leaks of rainwater – one small one near the hatch but no obvious means of entry and then another, more puzzling, dripping from inside the desk. Hmm, very Harry Potterish? It seems rain can creep in around mushroom vents on the roof or more likely around the window frames. It then travels along the gunwales until it finds a low point to drip. After ten years, seals go, I suppose. My friendly and also Aqualine boat owning neighbour, Barry, known as Baz the fish (amongst other things), loaned me a bottle of Captain Tolley’s Creeping Crack Cure – hmm, it works by you gently trickling this lighter-than-water stuff along any crack and it seeps in and seals it. Seems to have worked on the desk leak . . . now for the other one. We really can’t have any leaks if we’re to leave the boat for four months and sojourn in Mojacar. Next chore or delight, is the annual engine service – no, not where the vicar comes and we all sing praises to the Isuzu but where I don my coveralls and “play” with the diesel engine for 3 hours, trying hard to minimise the amount of swearing. It should be a simple job – remove old oil, put in new; renew oil & fuel filters, check it all over and then restart. Simples. Except being a trad stern, where space is maximised for living on board, there is a big sacrifice of space around the engine compartment. Some folk can take up boards and stand around or even walk around their engine. Me? I have to put on lots of lights and try and squeeze fingers around spanners, trying to feel my way to the obscure corners of the engine. The oil pressure gauge has never worked – it just goes to full scale deflection but now I realise, in fitting the oil filter, the leads to the oil pressure sensor have been pulled off (not me! Another guy servicing it before me! ), so sliding these back on and Voila! it reads again. Since it’s hard to undo sump plugs and get underneath a boat engine, they fit a little brass hand-pump, so you can pump out the engine oil – neat. Taking off the filters (one oil and two for fuel) is also a contortion with oily fingers and weird chain contraptions for filter wrenches. They do go in the end and plastic containers underneath to catch the spills of oil & diesel fuel are a must. So is remembering which way to turn when things are screwed in upside down. After a few hours, turn on the fuel and start her up only she wouldn’t. OK give her a bit longer and still she coughed and shook so violently, that Viv came to the back asking what the hell was going on!! I realise now that I should leave the ignition at position one, so that the electro-mechanical pump can pump fuel around the system – filling up those two filters and removing all the air . . . it has a return feed back to the tank so when all the bubbling and gurgling has stopped, that’s the time to re-start the engine and lo, it did. Phew! I may have saved £100 but is it worth it . . .??? Chore No 3 please. 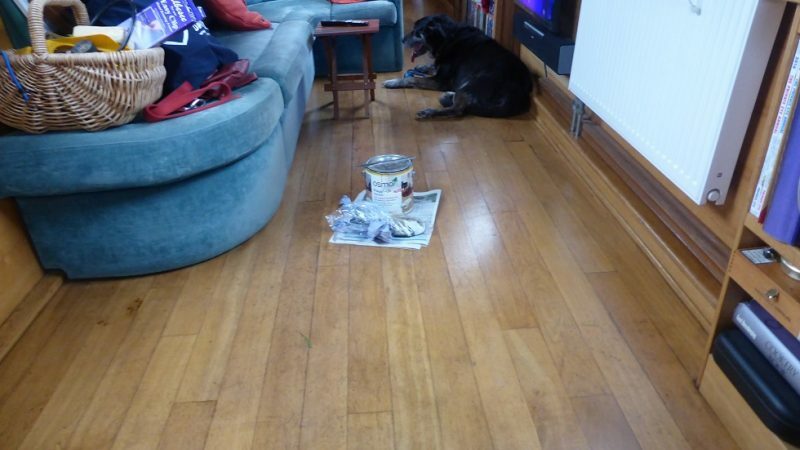 Viv’s away for the weekend , yeah-hah, let’s party . . . . or shall we re-oil the floor with that Osmo Polyx rapid? OK, floor it is. This involved cleaning the floor the day before. Removing everything from the floor. Choosing 2200 to start the chore, putting everything I need – including dog into the back bedroom. Slowly painting the oil onto the floor until reaching the bathroom. Retire early and let it take the 4-5 hours it needs to dry. Hmm, bits still sticky at 0800. Give it another coat Sunday night. Such fun. But it has made quite a difference. Maybe next year, we’ll carpet the whole lot?? Please? Next set of chores will be to winterise the boat for our 4 month holiday. It would be nice to live somewhere where the word winterise didn’t exist. Come on ERNIE make it happen!